Home to some of the most startling and unique scenery in Costa Rica, Rincón de la Vieja National Park and its eponymous volcano welcomes visitors to volcanic landscapes, complete with steaming fumaroles, boiling mud cauldrons, and natural hot springs. A literal hotbed of outdoor activity, the park is best known for its hiking trails, which range from easy to high difficulty. During the wet season, Rincón de la Vieja Volcano National Park turns green and lush, and the park’s waterfalls roar with activity. Hiking is the name of the game at Rincón de la Vieja. Both sectors--Las Pailas and Santa Maria--offer hiking trails that lead past a variety of sights, including waterfalls, volcanic craters, mud cauldrons, fumaroles, and hot springs, as well as through dry forest, cloud forest, and desert-like plains. The Las Pailas trail winds past some of the most unique scenery in Costa Rica, including past a small volcanic crater (complete with requisite sulfur stink), fumaroles, boiling mud cauldrons, and a small volcano. Rincón de la Vieja Volcano’s apex demands a difficult hike to reach. Not for the faint of heart, but the views are worth the hike. Rincón de la Vieja Volcano National Park covers 34,993 acres. 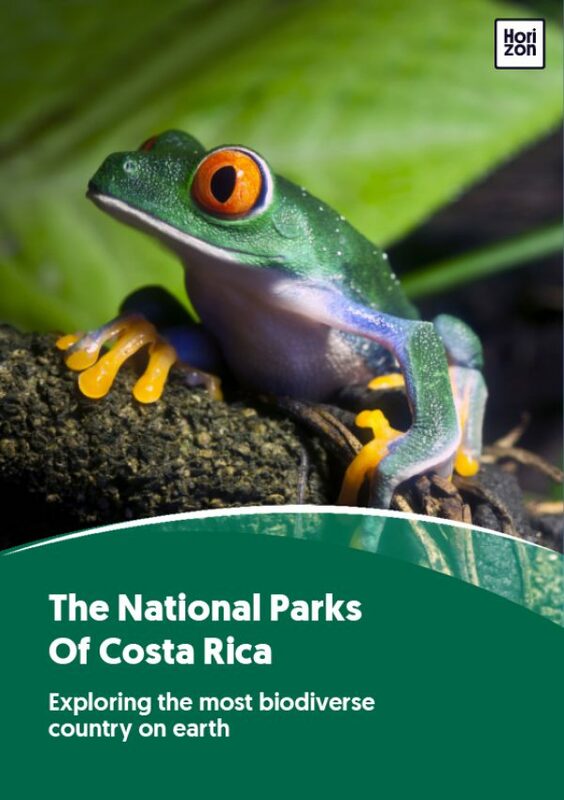 The park was established May 10, 1973, becoming Costa Rica’s eighth national park. Facilities include potable water, parking, a picnic area, and restrooms available within the park. Camping is permitted at Rincón de la Vieja Volcano National Park; you must bring all your own camping gear. There are two main trail loops, which originate at each sector entrance (Las Pailas and Santa Maria). The Las Pailas loop winds past a river, small crater, boiling mud pots, and other volcanic sights, with offshoots to the La Cangreja and Escondidas waterfalls, the crater trail, and Von Seebach Mountain (high difficulty). The Santa Maria loop leads off to the Colibrí trail, Agua Fria mudpots, Bosque Encantado waterfall, hot springs (moderate difficulty), and the mirador lookout point (high difficulty). Rincon de la Vieja is located in Guanacaste, the hottest and driest region of Costa Rica. However, the park straddles the Continental Divide, with a different climate on each side. The Caribbean (eastern) side is lush and wet, while the Pacific (western) sector--the more visited--is very dry during half the year. The Pacific (western) section experiences a dry season from December through April, while the Caribbean (eastern) section is wet and green year-round. The park, primarily the Caribbean side, receives nearly 200 inches of annual rainfall. On Rincón de la Vieja Volcano National Park’s dirt hiking trails, hiking is easiest during the dry season, when mud is minimal. Additionally, when water is scarce, wildlife gathers at the rivers, facilitating animal sightings. If you’re planning on making the long, arduous (8+ hour) trip to the volcano’s summit, it’s best to do so in the drier months when views are best. At the volcano’s base, the park’s trails wind through a variety of ecosystems, including plains, dry forest, and cloud forest, as well as volcanic ecosystems, including small craters, fumaroles, boiling mud pots, and hot springs. Rincón de la Vieja Volcano, contained within the park and the largest volcano in the Guanacaste Mountain Range, consists of nine contiguous craters. The volcano is considered “gently active,” which means that it sees only minor and infrequent eruptions. Rincón de la Vieja may be best known for its volcanic sightseeing, but there’s plenty of wildlife here, too. At least 260 bird species (such as three-wattled bellbirds, horned guans, emerald toucanets, various quetzals, curassows, and eagles) reside here, as well as a variety of mammals, including agoutis, anteaters, peccaries, howler monkeys, and white-faced monkeys. The park is also known for its abundance of shimmery blue morpho butterflies. The park is located 16 miles (about one hour’s drive) northeast of Liberia. From San José, travel 143 miles (about four hours) northwest. There are two entrances to the park: Las Pailas (the more popular) and Santa Maria (Rincón de la Vieja Volcano National Park headquarters). No buses run from Liberia to Rincón de la Vieja; the only access is via private transfer, a guided tour or taxi ($45+).